Knoxville has alot of funky, chic, and traditional sushi spots all fighting for their slice of "Real Sushi" or "Sushi Fusion". 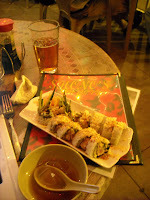 Well my favorite spot focuses on "Decent Sushi", great prices with fun presentation. Located on Market Square, Shono's is a great alternative to the flashy joints of Tomo, Nama, Sapphire, etc. It's Wednesday night (all you can eat for $18.99 night) and the place is hopping. On tap you can get Bud, Kirin Ichiban, Shono's brew, Zima, or Bacari Raz. The sushi is good. It's not the best in town and it isn't the worst. The rolls are creative, the flavors good, but there is just something lacking. The sushi here tends to fall apart from the inside out, the rice stays on the wrap, but the middle stays on the plate. Not all of it but just enough to be annoying at times. I have ordered the "Kamikaze Roll" and a bowl of Miso. The Miso is quite tasty, though Bella (the puppy) did spill half of it on the ground, she seemed to enjoy it as well. The "Kamikaze" is flash-fried tuna, cucumber, spicy sauce, topped w/ crushed red peppers. Spicy is good, especially when accompanied by a cold beer. I've had the Kamikaze before and it is tasty-delicious. 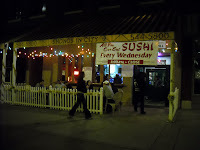 You can run the gambit on sushi here, Maki, Nigiri, Fashion, Inside out. The prices range from $4 to $13, and the portions are very generous. Eel, octopus, whitefish, tuna, you name it they've got it. And Happy hour is $5/ $7 pitchers of beer and $5 off bottle of wine. (A favorite date of the Mrs.) I just asked the server what time happy hours was and she said, "whenever"... "always". So I'll admit to being slightly confused on the details of this at the moment. The hours are definitely a little hard to adjust to as they are only open for dinner Wednesday through Saturday, though they are open for lunch everyday, but Sunday. And as for non-sushi types of food, you can get very good, filling, and inexpensive rice bowls. CK can be found here many weekdays for lunch so you know it must cheap... err good. I like your theme this week, nice job. One observation about Shono - aside from the Ichiban that is one ugly tap lineup! Do you know what the "Shono's brew" is? On tap you can get Bud, Kirin Ichiban, Shono's brew, Zima, or Bacari Raz. Pol, this may be my favorite post you have ever written. I will have to go there with you and the wife next time! Zima on tap?!! What did they do, stockpile kegs from the mid 90s? And the chicken bowl at Shonos is the best lunch deal on the Square, for frugal diners. i've never had anything but the Eddie Special at Shono's. It's too good not to get time and time again. Zima? Seriously? I'll remember to put some Jolly Ranchers in my purse whenever I try it out. Appropriate or Ignoring Knoxville's Past? rossini festival: downtown knoxville, etc.